i've missed you all! i've been a little under the weather this past week plus we've been having a heat wave in the pacific northwest and my craft room is blazing hot! but i'm feeling a bit better now, excited for a 3-day holiday weekend and i have about a dozen fans keeping me cool! 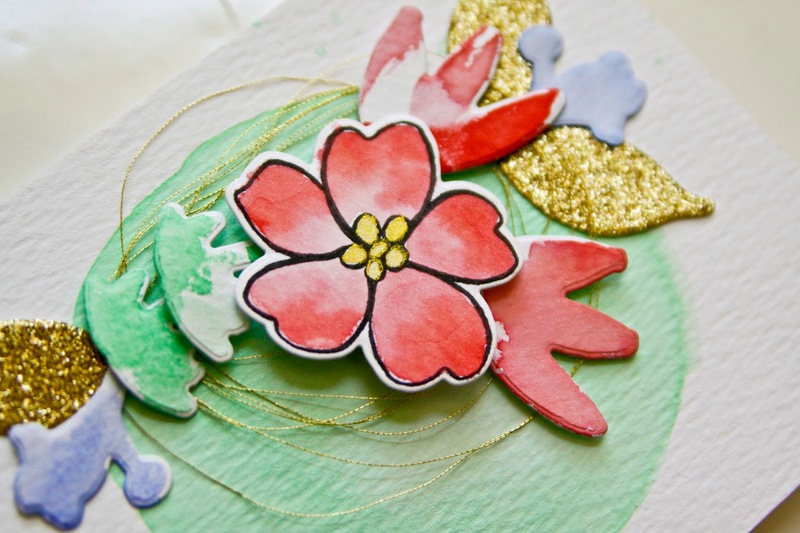 this card was inspired by the amazing watercoloring and layering of kim stewart, she is so talented! check out her blog, happy like yellow and check out this gorgeous layout. i started by watercoloring a circle of cracked pistachio on my favorite ranger watercolor paper. and my favorite way to watercolor with distress inks is to swipe them on my non-stick craft sheet and add water. i also added some metallic mint gelato for a little sparkle. while my background was drying i die cut leaves and foliage from essentials by ellen designer dies, bohemian garden from glitter paper and watercolor paper. i watercolored my foliage. 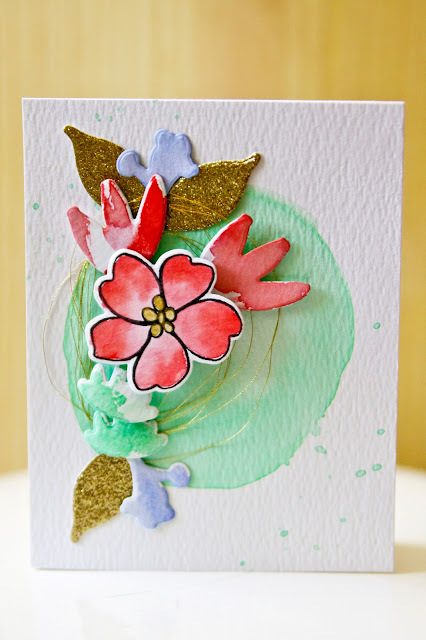 then i stamped a flower from the essentials by ellen clear stamp, bohemian garden. i watercolored it with abandoned coral and delicata golden glitz, then die cut it. to finish i layered all of the foliage and flower on the watercolored circle with gold thread and dimensional adhesive. p.s. in addition to being a 3-day holiday weekend, it's my birthday so i'll see you all next week! COOL compilation, it is hard for me to have the thread stay put!!! LOL!!! This is terrific!